AUCKLAND, 12th August, 2018 (WAM) -- The UAE Embassy in New Zealand has organised the inaugural 'Strategic Business Opportunities Forum' in Auckland, New Zealand, in cooperation with the New Zealand Middle East Business Council, NZMEBC, and INDEX Conferences and Exhibitions, a member of INDEX Holding. Supported by Hamdan bin Mohammed Smart University, HBMSU, and Khalifa Empowerment Programme "Aqdar", the forum discussed business opportunities in the UAE and ways to enhance trade and investment ties between the two countries. Representing the New Zealand side, the forum was attended by Murray McCully, former Minister of Foreign Affairs, New Zealand and Honorary Member of NZMEBC, Caroline Bilkey, Assistant Secretary for the Ministry of Foreign Affairs and Auckland Group Director and Stewart Germann, Chairman of NZMEBC, as well as a number of government and private sector representatives and an elite group of industry professionals and businessmen in New Zealand. The UAE side was represented by Saleh Al Suwaidi, the UAE Ambassador to New Zealand, Dr. Mansoor Al Awar, Chancellor of HBMSU, Chairman of the Governing Board of the UNESCO Institute for Information Technologies in Education, IITE, Ibrahim Al Dabal, General Coordinator of Aqdar World Summit and Dr. Abdul Salam Al Madani, Chairman of INDEX Holding and Executive Chairman of Innovation Arabia and Aqdar World Summit, as well as a number of officials and heads of delegations. Murray McCully delivered a welcoming speech in which he expressed his appreciation for the organisation of the forum and praised the strong political and economic relationships between the United Arab Emirates and New Zealand. For his part, Al Suwaidi thanked INDEX Conferences and Exhibitions for organising this unique strategic forum and invited companies from across the spectrum in New Zealand to participate in the prestigious events organised by INDEX Conferences and Exhibitions in Abu Dhabi and Dubai. "I would also like to thank Dr. Abdul Salam Al Madani, Chairman of INDEX Holding and Executive Chairman of Innovation Arabia and Aqdar World Summit for his efforts in organising such events of immense importance," he added. The UAE Ambassador to New Zealand also praised the strategic trade relations between the two countries, pointing out that the trade volume between the two countries has amounted to NZ$2.9 billion, making the UAE as one of the most important trading partners to New Zealand. He cited the multiple visits of senior officials from both countries as a driving force behind this unique and strong relationship; especially the visit of the H.H. 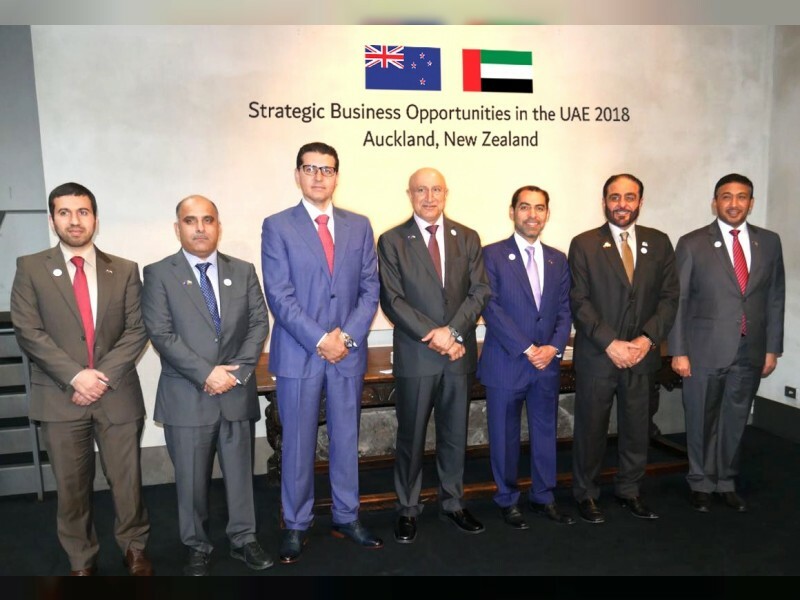 Sheikh Abdullah bin Zayed Al Nahyan, Minister of Foreign Affairs and International Cooperation, to New Zealand in May, that helped position the UAE as a gateway to do business from all over the world. "The New Zealand government has allocated AED140 million to its pavilion at Expo 2020, demonstrating New Zealand's keenness to develop and strengthen trade and investment ties between the two countries," Al Suwaidi added. Caroline Bilkey said, "New Zealand political and economical links with the UAE are as strong as they have ever been. The bilateral relationship is hugely important to New Zealand, and we aim to continue our mutual cooperation for the benefit of our two people. Commenting on the event, Stewart German expressed his pleasure for collaborating with the UAE Embassy in organising this event. "We aim to boost our business relationships, and I am very pleased to witness the recently growing activities between the two sides," he said.